Deploying enterprise Master Data Management initiatives requires different levels of maturity and capability, but achieving significant value and tangible benefits early in the process is very possible. 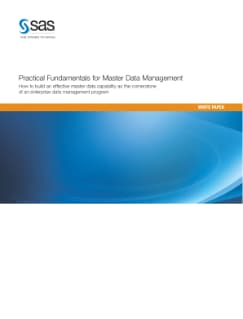 Since many of the benefits and value concentrate on simplifying and standardizing semantics, managing metadata and improving data quality, this paper suggests that starting with tasks that address those fundamental needs will add value and prepare your organization to take the steps needed to incrementally build the master data capability. This paper presents concrete actions that you can take to position those fundamentals as the first step in growing a long-term, business-oriented, enterprise information strategy.